RESOLVE Marine Services Alaska provides vessels transiting the Bering Sea, Western Alaska, and the Aleutian Island Chain with superior marine and ship repair services designed to meet the unique needs of this area. 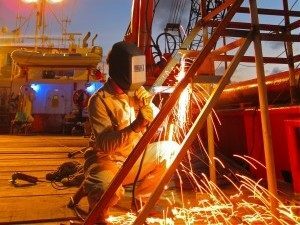 Our experienced team of welders, divers, naval architects, project managers, and salvage masters are based in Dutch Harbor and offer services to all types of vessels, including tug boats, barges, fishing vessels, manufacturing units, container vessels, tankers, USCG vessels, as well as the oil and gas industry. Whether your needs include salvage, welding, machine shop work, hull repair or general ship repair services, heavy lift equipment and crane usage, diving operations, or marine construction, RESOLVE sets the industry standard for unparalleled response and professionalism. RESOLVE also provides Alternate Planning Criteria (APC) coverage through our joint venture with the National Response Corporation (NRC). RESOLVE offers ship and hull repair services to vessels of the Bering Sea and Western Alaska through our state of the art ship repair facility located on 1200 feet of waterfront in Dutch Harbor. Our machine shop, fabrication shop, lay down yard, and 4000 square foot climate-controlled prefabrication facility allows us to meet the needs for marine services and pier side repairs. Additionally, our facility is located immediately adjacent to the Unalaska Marine Center (UMC), which offers unlimited access to our equipment and experienced personnel. RESOLVE offers a full suite of dry dock services provided by experienced fabricators, welders, and laborers. Fully equipped to haul 1000 ton, 200 foot long vessels out for any reason, whether it’s an annual class survey, routine maintenance, hull evaluation, or shaft/rudder/propeller work, the RESOLVE team allows you to spend your valuable time fishing rather than transiting to and from the Aleutian Chain. Schedule your dry dock availability today and get peace of mind knowing the professionals at RESOLVE are on your team. RESOLVE’s joint venture with the NRC provides clients transiting Alaskan waters with USCG approved Alternate Planning Criteria coverage and spill-response-ready emergency equipment. 1-CALL Alaska provides 24/7 vessel tracking and up to speed communications as the first means to prevent vessel casualties from occurring in Alaskan waters. 1-CALL surpasses simply fulfilling the USCG and Alaska maritime requirements of APC coverage by providing our standby AHTS tug as well as oil collecting and salvage barges, fast crew boats and other valuable assets. RESOLVE’s certified welders provide vessels transiting Western Alaska with the highest quality maintenance and repair welding work. RESOLVE’s team of experts stand ready to meet the marine construction needs of Western Alaska, including designing, constructing, or repairing seawalls, mooring pilings, docks, and boat lifts with our state of the art assets and construction vessel. RESOLVE provides superior engine mechanic work to Western Alaska, serving the needs of the fishing, oil and gas, and cargo transport industries. RESOLVE’s highly skilled team of divers provide underwater welding services, construction preparation, salvage assistance, prop replacement, locating and recovery assistance, as well as support for dry docking vessels. RESOLVE offers heavy lift and crane services to Dutch Harbor, the Aleutian Island Chain, as well as the surrounding areas. RESOLVE provides Western Alaska with certified personnel, materials and explosives required for specialty blasting in cases of demolition and marine salvage operations. For more than 33 years, RESOLVE Marine Group, Inc., has served commercial shipping companies, cruise lines, the offshore oil and gas industry, marine insurers, agencies, governments, and clients around the world. RESOLVE’s unmatched professionalism and commitment to our clients’ needs have made us a proud mainstay in the marine services industry. From maritime and firefighting training to marine salvage, emergency response, marine firefighting, and wreck removal, RESOLVE meets the full spectrum of the global maritime industry’s needs. RESOLVE SALVAGE & FIRE, INC.
RESOLVE’s core division, specializing in worldwide salvage, marine firefighting, OPA-90 compliance, lightering, wreck removal, and deep water diving, is a one-stop solution for shipboard fire and hazardous materials response. The training subsidiary of RESOLVE offers marine firefighting, emergency response and STCW training, ECDIS, and Full Mission Bridge Simulator training to tankers, cruise lines, cargo vessels, and yacht personnel as well as land-based firefighters.